If you follow me on Twitter or Facebook, you will know that I've had to be in hospital this week for an emergency appendectomy. (The appendix is a tiny organ whose only purpose in humans is to either do nothing or try to kill you,). 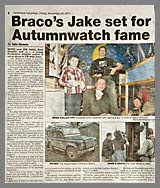 I am out of hospital now and thank you to everyone who left a comment or send me an email. 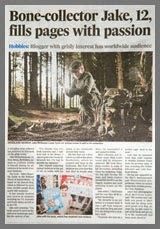 A week ago, before I went in to hospital, I was out exploring near the pine marten wood. 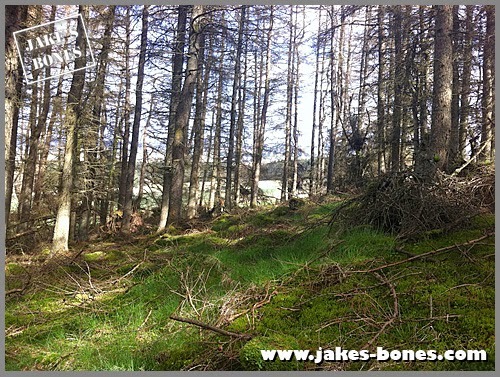 I wanted to see if there were signs of pine martens in the two other woods to the south which are quite isolated. 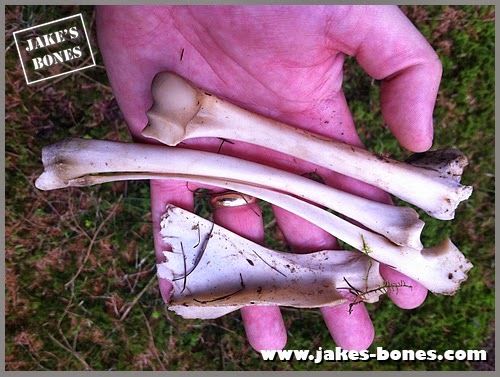 While I didn't find any signs of other pine martens there, I did find a load of other cool bones. Read on to see what I found last week and at other times ! 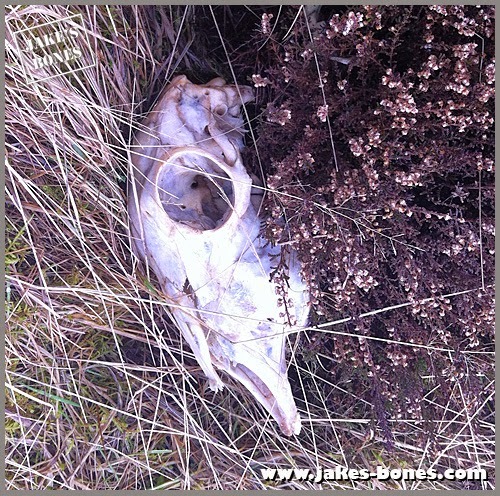 It was obviously a sheep skull, so I looked around for the lower jaws. 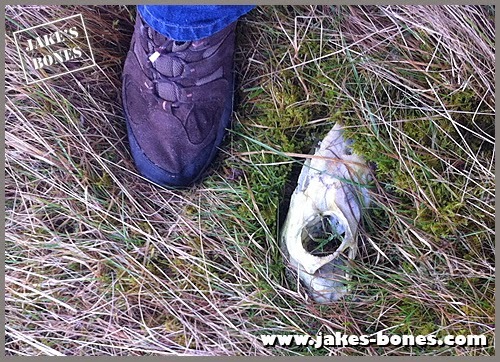 I found a set of lower jaws, and then I found two sheep skulls all in an area about 10 yard square. 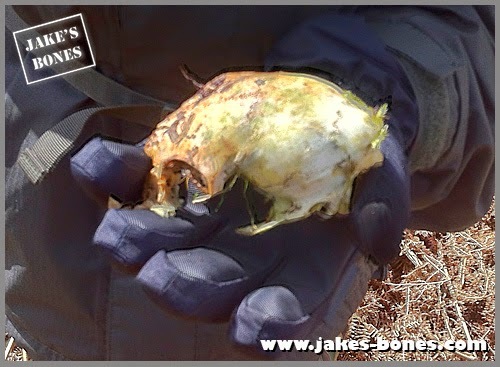 Now, it's not unusual to find sheep bones on the moor, especially as there was a sheep farm just over the wall, but why were only the skulls here, why were they so close together, and why was there no other bones from the bodies ? And this is what they looked like after all three had been cleaned. Look at the difference ! 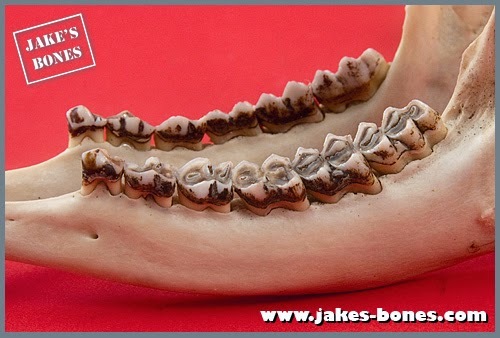 Here's the right hand side of the jaw and you can see the PM3 (third) tooth is missing. 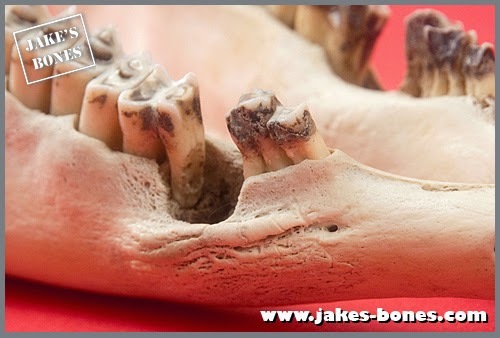 This looks like there was some infection or growth between the tooth and the jaw, and over a long time the bone grew around it. It is quite unusual to see something like this, and it must have been painful for the sheep. 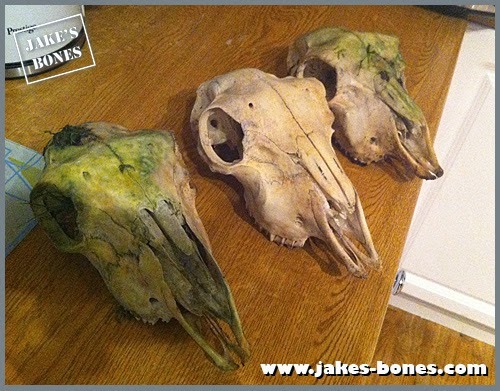 I've sold two of the other sheep skulls to the Irish School of Archeology in Dublin, which is cool because other people will be able to learn from them now. Corvids are the family of crows, jaws, rooks, ravens, magpies and jackdaws. They are clever birds which feed on carrion, worms and whatever else they can find. 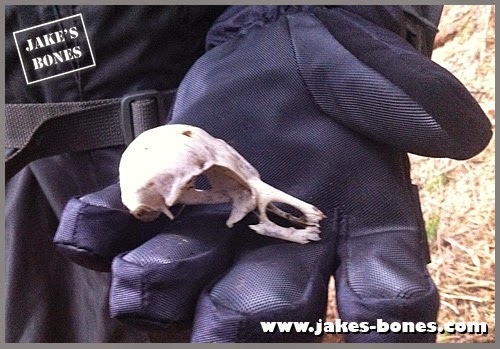 As soon as I saw this, I knew this skull which was in the New Pine Marten Wood was from a corvid, because of the distinctive shape. 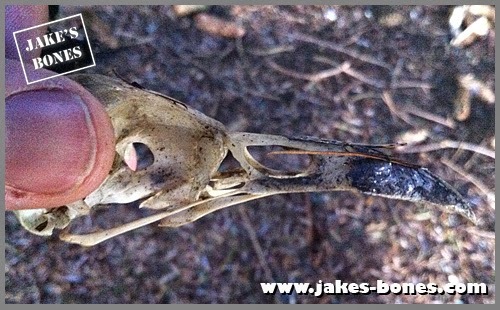 It is 83mm long, which is too big to be a jay, magpie or jackdaw, and too small to be a raven or rook, so my best guess is it's a carrion crow skull, even though it's smaller than the length Skullsite.com gives. My best guess is that these are injuries from a fight with either a buzzard or a sparrowhawk, although it might also be from an owl. 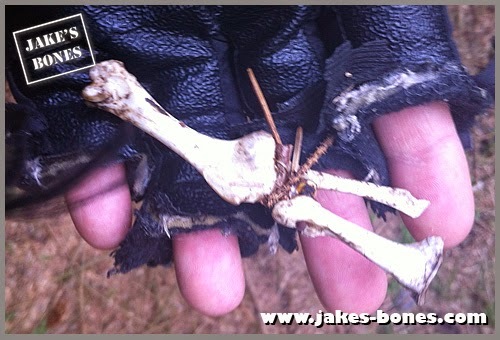 Further on I found these three bones still attached. The one on the left is from a bird humerus (upper wing bone) and the two others are the coracoid and the scapula. Here's a guide to bird skeletons to show you more. I'm not sure what type of bird they were from. It was a great view from the second wood. 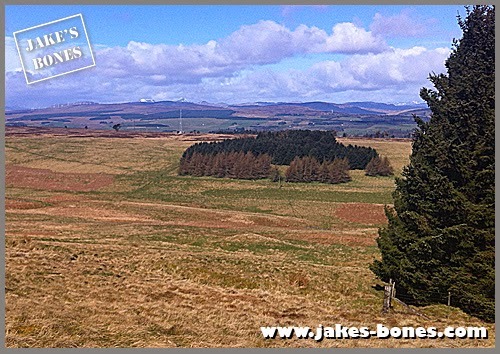 In the distance, you can see the new pine marten wood. I found this today, in an area of grass I'd walked past loads of times, which just goes to show how many things are there if you look hard enough ! 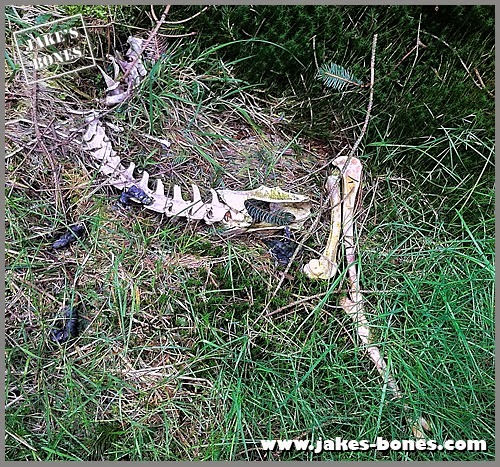 It must have lay there since December, which is when roe deer antlers fall off by themselves. 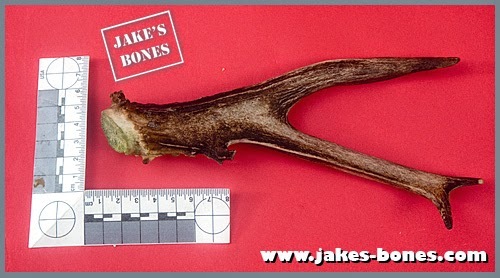 The antler is an unusual shape, with a very large front tine (spike) and the other two tines are much smaller. It is a good size, though, so I guessed it was probably from a older roe deer buck that was past its prime. From the end of the antler, I am guessing it came from quite an old roe deer, from a technique I have spotted from looking at my other roe buck skulls. 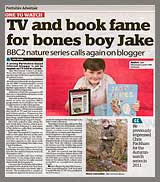 I'll write more about that some other time. 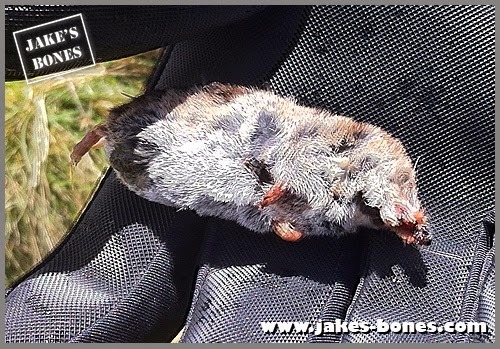 I found this freshly dead mole shrew (thats to Alex Northey for the correction x2 !) on the grassland between the two far woods. I really wish that I had taken it home but it's too late now. This was most of a roe buck skeleton, but the thorax, which is the upper back where the ribcage was, had been taken away. 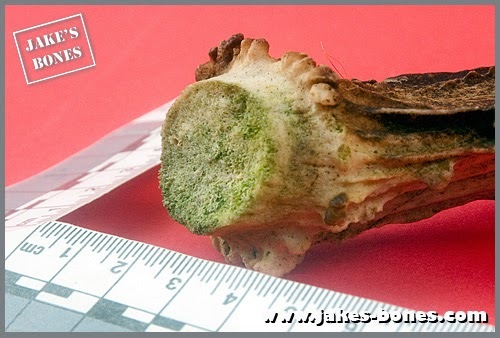 There was a lot of fox poo over it, which is common when foxes predate the body. The picture above shows the lower back, pelvis and one of the back legs. It was a roe buck with pretty nice antlers. It was definitely a keeper. 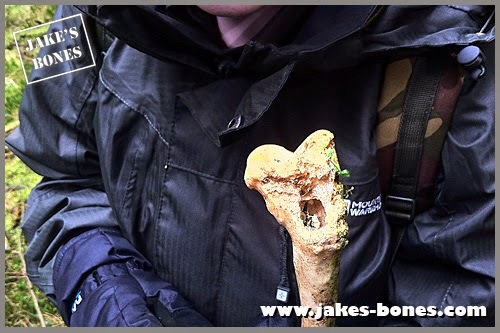 When I was looking at the bones, I found this femur, which had been chewed at the knee end. 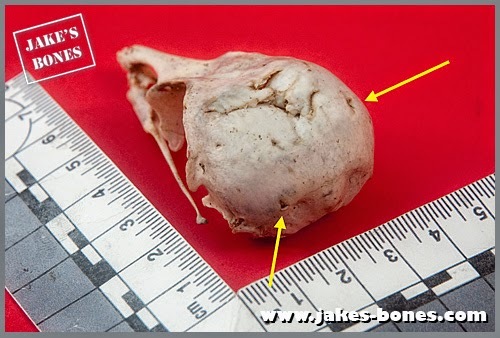 This might have been from a fox taking the meat off, or it might have been from another animal wanting to eat the calcium from the bones. 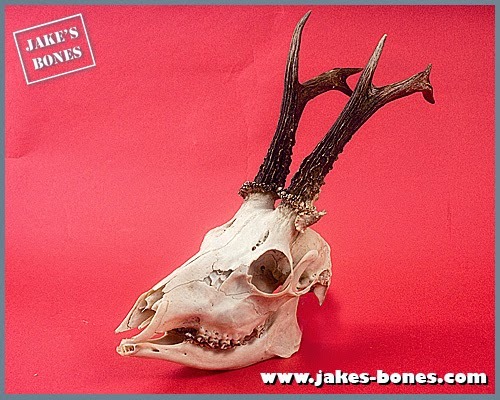 The unusual thing about this skull was the strange extra third antler coming off the left pedicle. I hadn't seen anything like that before, although I do have some roe deer antlers where one antler split into two. 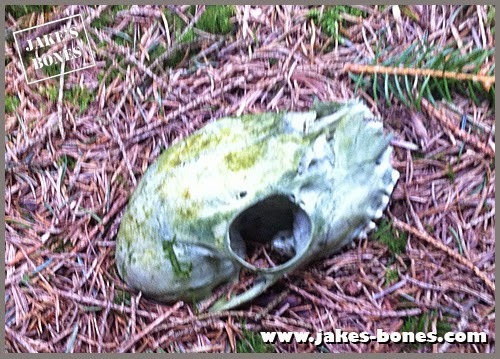 This skull was buried in the ground so all I could see was the eye socket ! 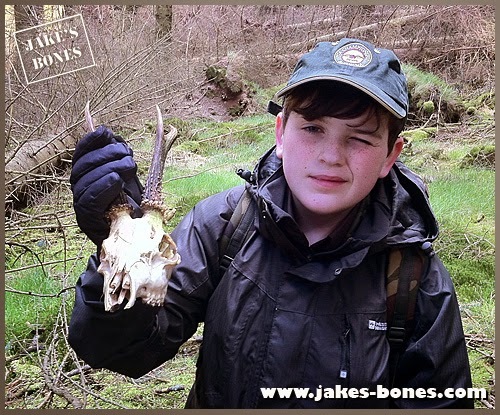 It was also a juvenile, female roe deer skull and it only had four teeth through. The nose has been bitten off by a fox, either to kill it by holding its mouth shut, or to get at the rich bloody tissue inside. 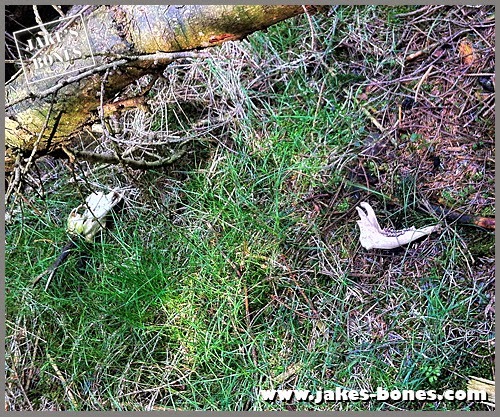 Nearby there were some front leg bones from a roe deer, but these bones looked like they were from an older deer because the radius and ulna are fused together at the wrist end and the ends of the bones were fused on, which happens between 12 and 18 months old in roe deer. Even so, they looked a bit on the small side. 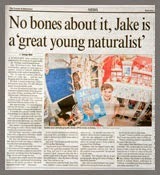 I only kept the most interesting bones, but even so it goes to show how many bones are out there if you look hard enough ! very interesting. Glad you are up and about again.I found a dead mole in my garden . I live in ardoch WayUnfortunately it had been lying a while and had to dispose of it but I love moles. 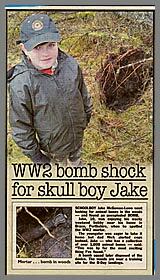 I found one when I was 4years old and terrified my mum by waving it in her face and saying look what I found lol. So many findings - how beautiful! 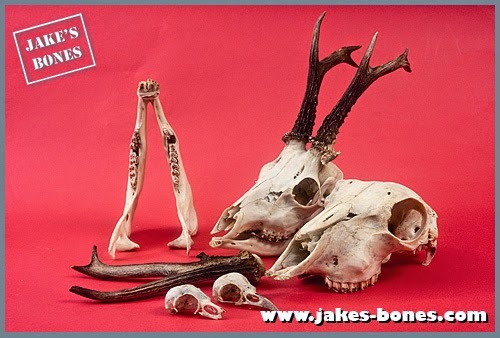 Especially the strange crow skull and the deer skull are cool. 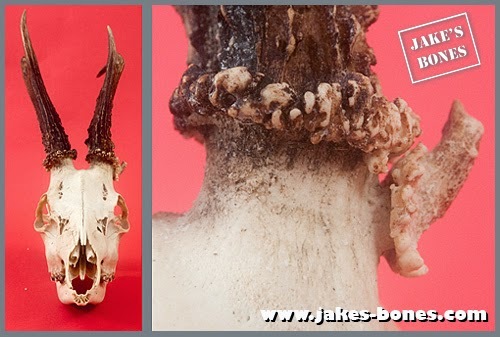 It seems that the deer had an axident in its early life so some "antler-growing" tissue splitted away. A very unique skull. This is Jonathan. 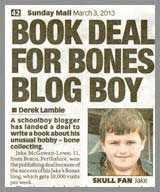 I have a project for my science class where I have to find a small animal and make a full body skeleton of it. I recently found a raccoon that was still pretty intact, and I am having trouble finding out how to clean it. 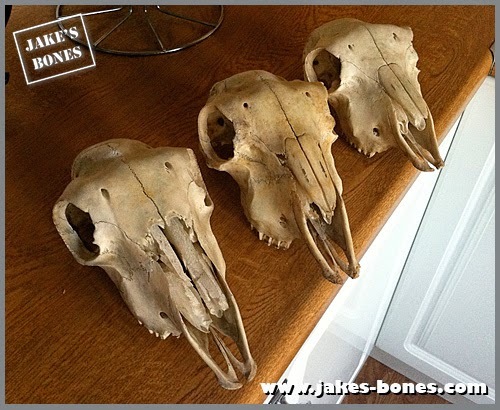 I am thinking about skinning it and leaving the bones, and then soaking it in hydrogen peroxide, and then reassembling the bones. But whatever I do I would have to do it sort of quick because the project is due in around a month. P.S. Glad to hear that you are feeling better. 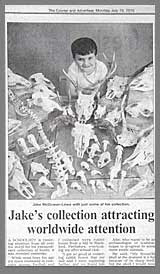 It show that it pays to look at every skull carefully; there is always something unique about them ! Neat post! That shrew is cool... Are you doing anything with it? 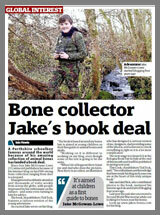 Those roe deer bones look bent. Is that normal for them, or is that something unusual? 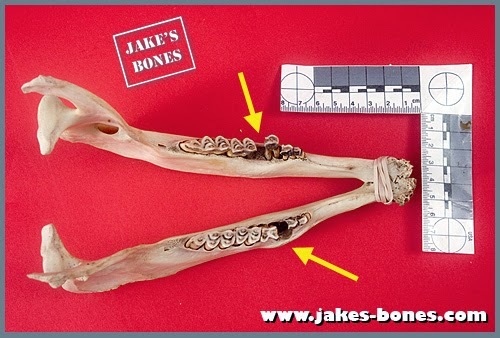 I have a white-tail deer ulna that's bent kind of like that, and I'm curious. The appendix actually has a use. The large intestine contains bacteria that feed on leftovers in the gut and produce vitamins for use. Some illnesses can destroy said bacteria, and the appendix acts as a sort of safehouse to contain a small amount of those bacteria as kind of a starter culture. Massacre on Migration: You need to read this now. Help end the "Massacre on Migration"